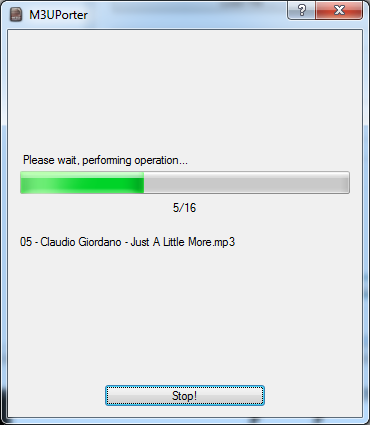 M3UPorterLarge is an application that copies MP3 files to a single directory, for use in your car, receiver, clock radio, or other slightly dumb USB MP3 player. To start, select a playlist and destination in the options page. And we’re done! Get a report of what happened. Missing input files are skipped. 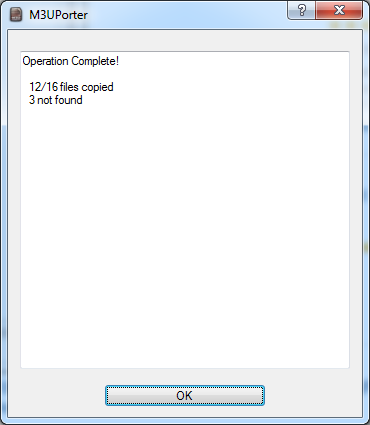 Copying stops if the output device is full. 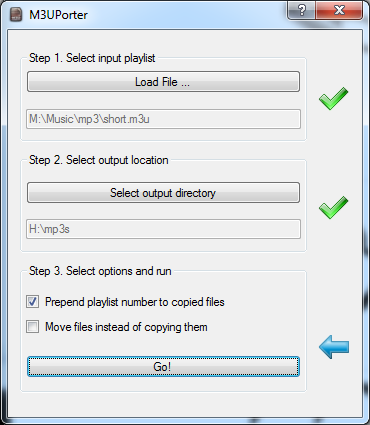 The parent project, M3UPorter was created because there was no simple way to copy the files in an M3U playlist to a single directory. Many portable devices and a lot of cars are just stupid, and can not handle files in subdirectories, or can not handle playlists, or both. I forked the project M3UPorterLarge to create new features that may or may not be accepted into the parent project. I need the same features, but with large playlists (generated by the as-yet-unreleased Unnamed Jukebox) that won’t fit on my USB thumb drive. PorterLarge should be considered an unofficial feature-development branch of the M3UPorter project, adding support for more features that may or may not be accepted. I find that devices that have very good suppot for iPod and iPhone have very poor support for normal USB devices. My Mazda’s BoseTM audio system even displays “iPod” on the screen when you plug in a generic USB stick, and gets very stupid when albums or artists are sorted into subdirectories. I don’t know whether the companies are just lazy, or whether AppleTM contractually obligates them to dumb down their USB support. In either case, it is most disappointing. This program requires .NET 4.5 and, therefore, Windows.